I am a queer, bigender immigrant from Eastern Europe. I haven’t written seriously until my early thirties, when I finally chose the language for my poetry and prose: English, which is either my third, fourth, or fifth (quasi)native tongue. I was born in Ukraine, and lived in subarctic Russia and Israel before coming to the US for graduate school at UC Berkeley. I now live and teach in the Midwestern US. The struggle for language, for voice, and the often uneasy melding of cultures and viewpoints inform my life and my writing. 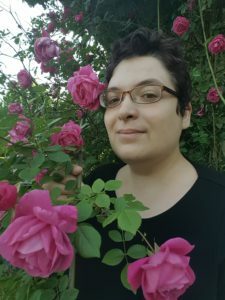 If you’d like to follow my work, you can subscribe to my newsletter, follow me on Twitter (@roselemberg), and/or support me on Patreon. My stories have appeared in Beneath Ceaseless Skies, Lightspeed, Strange Horizons, Uncanny Magazine, Unlikely Story, and other places, and my poetry in Apex, Goblin Fruit, Interfictions, and elsewhere. My Birdverse novelette “Grandmother-nai-Leylit’s Cloth of Winds” has been nominated for the Nebula award in 2016. This story was also on the Hugo Longlist, and the Tiptree Longlist. My debut poetry collection Marginalia to Stone Bird (Aqueduct, 2016) is a Crawford Award finalist, the first poetry finalist in the history of the award. My poems have been nominated for the Rhysling award every year since I began publishing, and in 2014, my poem “I will show you a single treasure from the treasures of Shah Niyaz” has taken 3rd place in the long poetry category. I have won the Rannu competition with “In the Third Cycle“, an epic poem in the Journeymaker cycle. My poems have won (2012, 2013, 2015) and placed (2013, 2014, 2015) in the Strange Horizons Readers’ Poll. In 2016, one of my poems made the Locus Recommended Reading List. Connor Goldsmith of Fuse Literary represents my novel-length work. If you are curious about my writing, please check out the Bibliography, Projects, or for a quick taste, the Lemberg Sampler. My lived experience as a twice- immigrant informs every aspect of my life. Most of my life until recently I lived in constant fear and felt the pressure to pass to survive. I still feel this pressure, but I am now in a position to push against it. I am queer (in terms of sexual orientation) and a non-binary trans person. I usually list my gender identity as bigender (sometimes as genderqueer). My pronoun is “they.” I do not participate in binarist projects (e.g. I will not submit to “stories by women” anthologies). My spouse is Bogi Takács, a fellow queer, trans, and Eastern European Jew. Yay for us! (Really, yay for us!) For those keeping tabs, our marriage is not valid in our countries of origin. I am a self-diagnosed autistic person parenting an autistic child. My spouseperson is also autistic. We are a neurodiverse family, also known as the Plonky family 🙂 Three of my published Birdverse stories featuring autistic protagonists: “Grandmother-nai-Leylit’s Cloth of Winds” (Kimi), “Geometries of Belonging” (Dedéi — and actually also Parét, though this needs more unpacking), and “The Book of How to Live” (Efronia). I live with chronic pain and a variety of invisible illnesses which affect my daily functioning to various degrees. I am a trauma survivor and have depression and anxiety. I have been outspoken about disability and access from #ownvoices perspective. I am a Jew with a keen interest in Jewish texts, languages, and histories. I used to describe my observance as “traditional,” but it is not accurate right now as my observance is in flux. I left Jewish Orthodoxy in the process of coming out as queer and trans. I keep kosher, so if you kindly want to feed me, vegan meals are the answer 🙂 for anything else, please ask! If you’d like to get in touch, please leave me a comment anywhere on this website. Thanks! My favorite fruit is the quince. In 2008, I told the readers of Goblin Fruit that it’s the Asian pear. Sorry about that! I didn’t want to derail the discussion on that post, but I have to tell you I’ve written that book! It’s about a postmodern feminist demonologist at a modern University who spends spring break searching for the source of magic — though as it all takes place during spring break, she’s spared the departmental infighting. It’s called ‘A Lovesome Thing’ and you can find links to it at my website, as well as other works of fantasy for faculty. Thanks for a great discussion of feminist characters. I will be forwarding it to my friends to use in a feminist forum on YA fiction that we are leading this Wednesday. Awesome! I’m going to check it out. And please don’t be afraid to derail the discussion. While it is impossible for one person to know about all the literature available out there, it is definitely great to receive recommendations. I just wanted to say I really enjoyed your story in DSF yesterday. Sarah – thank you very much! It means a lot to me. Was Moment of Change sent out yet? I haven’t received my copy. PS–Hope my name was spelled correctly in the book–it isn’t here. As far as I know, the copies were not sent out yet – Timmi and the Aqueduct team were away at Wiscon. Your name was corrected in the book, but I forgot to update my entry – sorry about that! Hello! We met at the poet’s dinner at Wiscon this weekend. I was sitting across from Sofia. Can you send me your email address? I’ve already had a chat with some of the board members of the CBS and need to ask you a few questions. Rose, I was hoping to send you a personal thank-you for Here, We Cross; do you have a non-ST email address I could use? Thanks. My name is Matthew DeBlock, I am a Canadian currently living in China. I came across some of your writings in my usual searching and “nerdyness”. I have developed a conscript ( constructed script ) called Dscript that I have been developing for nearly a decade. It “matured” to a reasonable level recently. Dscript is a 2D writing system that truns alphabetical words into glyphs and symbols, they look quite “ancient/alien” that are legible in both letters and sequence. If you or anyone you know may be interested in applying Dscript I will gladly help out in whatever way I can, free of charge of course. Dscript itself is creative commons, free to copy, edit, sell by anyone. I am always happy to see it used. I’m Spanish science fiction/fantasy fan and translator. A few months ago, I read your story “Seven Losses of Na Re” in DSF Fiction and I loved it. I’ve recently launched Cuentos para Algernon, a non-profit blog where I’m publishing my translations of short stories I love, with the only aim of giving Spanish readers the chance to enjoy them as much as I did. As I said before, I loved “Seven Losses of Na Re” (and I plan to read now the rest of your stories that appear online), so I wanted to request your permission to translate and publish in my blog one of your stories (probably “Seven Losses of Na Re”, but I’m not sure yet; I’d let you know when I decide it). I had the joy this morning of coming across your poem “Archival Testimony Fragments/minersong” from Uncanny Magazine. I just wanted to tell you what a wonderful piece it is; it’s such a creative weaving of language, and strikes me as very powerful in the discordance of the different voices. Thank you so much for reading and commenting, and for your support. It’s always lovely to come across another person interested in archives and history. As per instructions on your home page, I am querying about a submission. “The Curtain’s Part” was submitted over six months ago. I’m clearing my books, and I have no response from AoE. Hi Eric, I just forwarded you the response I sent you on 10/21/2014. My name is Renne. I’m an editor of Science Fiction World Magazine(China). Congratulations for the Nebula Nomination! I am looking for a way to get in contact with you because I want to introduce your story to Chinese readers by reprinting it on our magazine. Could you perhaps drop me an email so that we can talk about details? You can reach me at zhongry@sfw-cd.com. Would be thrilled to hear from you. Rose, your blog will soon be added to our Actually Autistic Blogs List (anautismobserver.wordpress.com). Please click on the “How do you want your blog listed?” link at the top of that site to customize your blog’s description.